"As a journalist fresh out of college, my first investigative report was on an alcohol treatment center. Now I'm in one." Over more than a quarter of a century of covering the news at four different television stations, no one in the nation earned more Emmy awards for outstanding journalism than John Boel. As he stocked his shelves with statues, the news anchor and investigative reporter publicly humiliated scores of people. But a bigger story was developing inside him, and everything changed when Boel found himself "in" the news instead of "on" the newscast in his comfortable anchor chair. Suddenly disgraced, unemployed, and a thousand miles from home in an alcohol treatment center, he was forced to confront his misconceptions, his character flaws, his past and his disease in a very public way because he is a public figure. In On the News ... 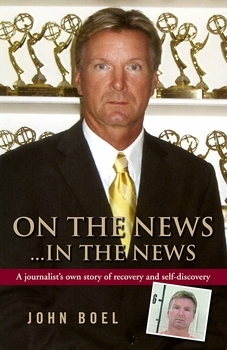 In the News, Boel shares 25 years of fascinating stories from one side of the camera, then takes readers to the other side, through his powerful and intensely painful journey from the public shame of two high-profile DUI arrests through recovery and self-discovery. In a celebration of his first year of sobriety, Boel recently completed the 140-mile-long Ironman Triathlon in less than 12 hours, telling his friends and family at the finish line, "After what I've been through this past year, the Ironman was nothing." A good journalist tells the whole story. John Boel hopes his story will help educate others about a chronic, progressive disease that ruins more lives every day than any hidden camera ever could.